Coastal Integrative Medicine is committed to providing patients the up-to-date medical neuroscience and good value in neuromodulation including Repetitive Transcranial Magnetic Stimulation (rTMS). What is rTMS used for? Antidepressant medications and psychotherapy are the first line treatments for major depression, but don’t work for a third of patients. rTMS is used as next-level treatment and may augment antidepressant medications or psychotherapy. rTMS has other still investigational applications to include chronic pain, PTSD, TBI, Learning Disabilities, ADHD, and neurodegenerative conditions. rTMS is a non-invasive procedure done in our outpatient office. The results are similar to those of ECT, but rTMS has several advantages. First, the patient is not under anesthesia and can actually relax, read, or listen to music during the 30 to 45-minute procedure. Utilizing the more recent theta-burst methods and equipment, we are able to improve the patient experiency with shorter patient treatment times. A small curved device, about the size of a cupped hand, rests lightly on the patient's head, delivering focused magnetic stimulation directly to the selected area of the brain. The magnetic field pulses are the same strength as those used in magnetic resonance imaging (MRI) machines. Patients treated with rTMS have fewer side effects than those treated with ECT. The most common is scalp irritation from the pulses, which are similar to being tapped repeatedly. 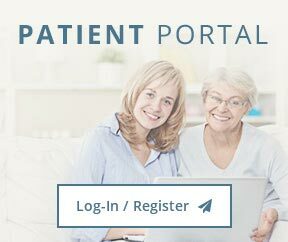 Typically patients receive four to six weeks of daily treatment, and some patients receive regular intermittent treatments thereafter to alleviate low mood. The principle of therapeutic magnetic stimulation is based on the following. The magnetic stimulator uses magnetic pulses of short duration. The emerging high-intensity electromagnetic field easily penetrates through skin, cranium bones and soft tissues. As a result, the electrical current is induced within the cortex. This electrical current can modulate activity and excitability of the cortex for a period of time exceeding the stimulation session time. 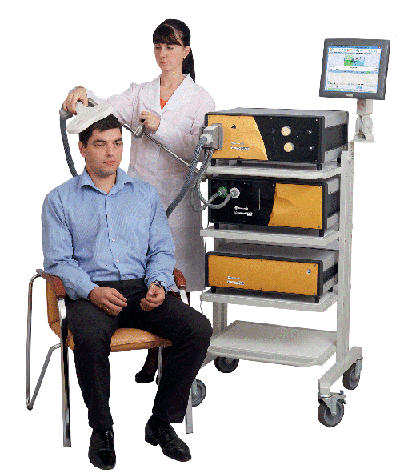 Repetitive Transcranial Magnetic Stimulation (rTMS) involves applies magnetic pulses that can induce electrical currents in focused areas within the brain. The frequency (how fast or slow) of pulses activate or inhibit brain cells. High frequency rTMS in prefrontal brain regions stimulate neurons involved in mood regulation. rTMS may modify brain circuits, neuron growth factors (BDNF), neurotransmitters (serotonin, dopamine), and increase brain-derived (endogenous) opioids. Clinical studies have clearly demonstrated that rTMS Therapy can help achieve remission for patients living with severe depression. For many patients, depression symptoms significantly improved or went away after 4 to 6 weeks of treatment with TMS Therapy. In an NIMH-funded, independent, randomized controlled trial, patients treated with TMS, were four times more likely to achieve remission compared to patients receiving sham treatment (P = 0.0173; odds ratio = 4.05). TMS was included in the 2010 American Psychiatric Association (APA) Practice Guideline for the Treatment of Patients with Major Depression—guidelines that provide recommendations for how psychiatrists treat depression. This neuromodulation has been proven effective and has been FDA cleared for depression. What happens with an rTMS procedure? A patient sits in a comfortable treatment chair. Patients are asked to remove any magnetic-sensitive objects (such as jewelry) since rTMS uses magnetic pulses that can heat magnetic metals. Patients wear earplugs during treatment for hearing protection, as rTMS produces a loud clicking sound with each pulse. During the first extended session, a motor threshold is found. This is the amount of machine energy needed to make a portion of the hand move when the coil is placed on the head in areas associated with motor movement. This measure helps establish the patient’s rTMS treatment dose to stimulate neurons. The rTMS coil is properly positioned over the patient’s head for the motor threshold and subsequently repositioned into the treatment location. During the treatment, the patient hears a series of clicking sounds and feels a tapping sensation on their head under the treatment coil. Coastal Integrative Medicine utilizes a unique method to locate the brain region of interest that combines standard methods with advanced digital analysis of the breain region functions and deviation from normal. This brain mapping measure is recorded prior to the rTMS therapy in order to provide a baseline level of brain region functioning. Subsequent brain function measures allow accurate tracking of changes and indicate which areas within the brain are changing as a result of the treatments. rTMS is always prescribed by a rTMS physician and then administered by a rTMS operator or doctor. A treatment itself is administered by an experienced and highly trained rTMS operator under the supervision of the rTMS physician or by the rTMS physician themselves. The patient can stop a treatment at any time by verbalizing this request to the rTMS operator. How long is an rTMS procedure? It depends on the rTMS protocol and machine type. Some conventional, FDA-approved rTMS protocols can take upwards to an hour, but generally take about 30 minutes. Other protocols can be done in 20 minutes or less. The success of the treatment is dependent not on a single session but a series of sessions that are commonly done 5 days a week for 4 to 6 weeks followed by a 3 week taper. We commonly taper by giving 3 treatments in week 1 taper, 2 treatments in week 2 taper, and 1 treatment in week 3 taper. Do I need to be hospitalized for a course of rTMS? No. Unlike ECT, rTMS does not require any sedation or general anesthesia, so patients are fully awake and aware during the treatment. There is no “recovery time”, so patients can drive home afterwards and return to their usual activities. This also means that rTMS is not offered during hospitalization either. Future research is needed to show that rTMS can be done effectively in an inpatient setting and reduce hospitalization duration, improve outcomes, and reduce rehospitalization rates before insurers will agree to pay for inpatient rTMS. What are the side-effects of rTMS? There are few side effects associated with rTMS. Pain sensation at the site stimulation is common early in the rTMS series. This significantly decreases over the course of rTMS stimulation. Thereafter the most common side effect is headache, which is reported in nearly half of patients treated with rTMS. Headaches are mild and generally diminish over the course of the treatment. Over-the-counter pain medication, such as ibuprofen, can be used to treat these headaches. The rTMS machine produces a loud noise. No evidence suggests there is hearing loss if earplugs are worn during the treatment. rTMS is not associated with many of the side effects caused by medications, such as gastrointestinal upset, dry mouth, sexual dysfunction, weight gain, or sedation. There are some medications that may hinder or enhance the results of rTMS. The most serious but rare risk of rTMS is seizures. However, the risk of a seizure is exceedingly low. We have never had a patient have a seizure from rTMS. What would make me ineligible for rTMS therapy? How can I get rTMS treatment? Before scheduling you for rTMS treatment, we conduct a careful review of medications, current labs, order new labs that we believe are missing, and conduct a comprehensive EEG, ERP, and ECG study from which we can source localize and score all brain regions against normal samples. This initial work is important since in many cases we can optimize results by uncovering other medical conditions that contribute to depression and cognitive impairments.